Jet Airways Chairman Naresh Goyal on Monday stepped down amid a debt crisis in India's second-biggest airline, which he nurtured for nearly 25 years. His wife Anita Goyal too has quit the Board of Jet Airways. This would pave the way for investors including State Bank of India to rope in its own official to head the airlines. SBI has proposed a Rs 1,500 crore plan to take the airways of its current crisis by paying salaries to its employees and re-pay part of its debt to the lenders. Jet Airways on Sunday 24MAR19 re-opened reservation for service to Hong Kong. From 01MAY19 to 31MAY19, the airline will continue to operate 1 daily flight each on Delhi – Hong Kong and Mumbai – Hong Kong route. Reservations for travel on/after 01JUN19 is not available. Another 737-800 , VT-JFA, has been returned to lessor. Jet Airways is currently operating 35 aircraft and may take this number to 75 by April-end, if it is able to convince lessors who have grounded planes over dues to fly them again. The airline’s officials met top aviation officials on Tuesday to discuss a roadmap for the next couple of months. This comes a day after Naresh Goyal stepped down from Jet's board and lenders agreed to give emergency funding of Rs 1,500 crore. “We are trying that in the approaching summer peak travel season the capacity crunch eases. We have observed fares on some sectors occasionally spiked up and have asked airlines not to do that. Jet officials said they will speak to lessors and hope to get 40 grounded planes back in operation by next month end. They will inform us by next week exactly how many planes lessors have allowed them to fly and by when,” aviation secretary Pradeep Singh Kharola said after meeting Jet officials along with DGCA chief B S Bhullar. The capacity crunch has been caused largely due to Jet grounding its aircraft. The crunch later aggravated as SpiceJet grounded Boeing 737 Max and GoAir grounded A320 Neo. The situation got worse when other airlines like Air India and IndiGo also started cancelling flights. Kharola said the government is looking at giving the slots not being utilised by Jet in airports in India and abroad to other Indian carriers for a certain time. Jet Airways on Tuesday 26MAR19 filed additional inventory changes, which now sees Mumbai – London Heathrow service being reduced from 3 to 2 daily. From 31MAR19 to 26OCT19, 9W116/115 service is closed for reservation for all class of service. The chairman of State Bank of India made an interesting comment in an interview with BloombergQuint on Monday, minutes after news broke that the Goyals were leaving Jet Airways Ltd. and the airline’s lenders were looking for a new investor via a competitive bidding process. When asked whether Etihad wanted to remain an investor in Jet, or go, Rajnish Kumar said “It is their choice. Even for Naresh Goyal, it is his choice and his capability to bring in funds. Doors are open for everyone...”. It was an odd thing to say for a lender that had just succeeded in evicting Naresh Goyal and his wife Anita from the board of Jet Airways. The Goyals are the promoters of Jet, at one time India’s largest private sector airline, now third-largest. Also, most indebted. Their failure to run the airline profitably, and an over Rs 8,500 crore pile of debt is what prompted their eventual departure from the 25-year old airline. Evidently, the lenders were convinced that no new investor would consider putting money to work at Jet if the Goyals stayed on. That's a damning indictment of, at best their mismanagement, at worst their lack of bonafide intent. And yet within minutes of having announced this decision, the SBI chairman was leaving the door open for Goyal’s return? Jet started as an air taxi operator in 1993 and a full fledged airline in 1995. All the other airlines born in that decade died. There are a few survivors from the next decade but Goyal and Jet have stood the longest. And fought the hardest. Goyal was a non-resident Indian when he founded Jet. The airline was owned by Tail Winds, an Isle of Man company in which Goyal owned 60 percent, and Gulf Air and Kuwait Airways owned 20 percent each. At the time, foreign direct investment of up to 40 percent was permitted in Indian airline companies. NRIs were allowed to own 100 percent. Such a liberal foreign investment policy, all the way back in the early-1990s? Goyal was a lucky man. And has held on to the luck. In the 25 years since then, India’s aviation policy has facilitated his interests the most. When the Tatas wanted to re-enter aviation in the late-’90s, in partnership with Singapore Airlines, aviation policy suddenly changed to disallow investment by foreign airlines. Goyal replaced his two investors and carried on flying. The Tata Group replaced its partner but was still not granted a license. In December 2004, two months before Jet Airways did an initial public offer, aviation policy underwent a historic change, allowing Indian airlines to fly abroad. But only if they had been in operation for at least five years and had a fleet of 20 aircraft. Of course, Jet was the only one who qualified. Till the policy was scrapped in 2016 it served to protect Goyal’s interests by denying many of his competitors lucrative overseas routes. But no policy could protect Goyal from the onslaught of budget carriers. Air Deccan, Indigo, SpiceJet...they slowly encroached on Goyal’s empire that was so far standing in equal parts on good service and political protection. That’s when Jet made its first biig error. The acquisition of Air Sahara in 2007. A poorly-run airline that hung around Jet’s neck like a stone. By 2013 Jet was in dire need of capital, what with debt of over Rs 11,000 crore. How lucky then for Goyal that just months, literally months, before he announced a deal with Etihad Airways, the government changed aviation policy to permit foreign airlines to invest in Indian carriers. The Jet-Etihad deal was also accompanied by a substantial increase in bilateral flying rights to Abu Dhabi, Etihad’s headquarters. And though Etihad paid an over 30 percent premium for a 24 percent stake, its participation rights in Jet were severely controlled. Ostensibly by the government or regulators but it worked just fine for Goyal as well. But eventually even that money ran out. So has Goyal's luck. The airline that once boasted of being India’s biggest and best carrier, credit to Goyal for that, defaulted on a loan in January 2019. If it weren’t for the Reserve Bank of India’s 2018 circular, Jet might have gotten a longer rope. But the default kicked off a 180-day debt restructuring deadline, after which lenders would have to file insolvency proceedings and make enhanced provisions for the debt. For a moment it seemed that Etihad would come to the rescue again. But a variety of factors, including its own financial situation and disagreements with Goyal, made Etihad a prospective seller not buyer. A new investor would have to be found. But who would want to move in with the Goyals? It took lenders weeks to convince the Goyals to give up their board seats and his chairmanship. Though they still have two nominees on board. Kumar also stated in another interview that Goyal has signed a binding agreement with lenders to reduce his current 25.5 percent shareholding in the airline to below 10 percent, if a new investor so wants. “Both Etihad and Goyal will have to sell their stakes as desired by the new investor,” Kumar said to Economic Times. In a hurry to see him go and yet keeping the door open for him to return? Remember, any resolution plan will involve capital infusion but won’t involve paying off all debt at one go. Instead, it will be restructured to a viable level. And Kumar and the lenders have no problem if such a plan is presented by Goyal. At the time of the acquisition of Air Sahara in 2007 by Jet, both Indigo and SpiceJet were in their infancy and Jet had ample time to make the necessary changes with Air Sahara. And for the most part Air Sahara/Jet lite is not the main culprit for Jet's woes. Also the acquisition was not as bad as Kingfisher's acquisition of Air Deccan. Jet was caught by surprise by aggressive expansion of Indigo and to some extent Spice Jet, both in domestic and also in nearby International routes. Jet thought its reputation and the fact it has a frequent flyer program could stem the LCC expansion, but in India, the frequent flyer programs have not taken off. Increase of price of oil in early 2018. Decrease of price of oil prior to that, and Jet failed to take aggressive action to protect their turf. They should have monopolized BOM by introducing new flights and could have the LCC's growth restricted at least in BOM. Failed Brussels experiment, Jet was another 1 stop carrier to US competing with other 1 stops which have more access to many Indian cities and US cities. And of course, continued aid to AI (affects Jet more since AI is the main international competitor to Jet) and Shiv Sena meddling with Jet's business by forcing Jet to take back laid off employees. Two more 737-800s have been returned to lessors : VT-JTF & VT-JTG. Jet Airways in the last few days further revised planned international service, as the airline closed reservations for selected regional service on/after 01MAY19 once again. Additional routes also see service suspension for the month of April 2019. Inventory changes as of 31MAR19 as follows. All inventory remains subject to change on daily basis. Jet Airways has grounded 15 more aircraft. The airline had on Tuesday afternoon told DGCA, which is monitoring the situation on a daily basis, that it was flying 28 planes. Then late on Tuesday, it told BSE about the grounding of 15 more planes. Even after this latest grounding, an airline spokesman said Jet was flying "about 30" planes. The situation is worsening due to delay in infusion of emergency funds. The airline, which once had 124 planes, now has a barely double digit fleet. Asked about the active fleet of the beleaguered airline, the aviation secretary said here that "yesterday, it was 28". Lessors better get a hold of all their planes before its seized by the banks and airport authorities and eventually becoming rusted aluminium cans thanks to bureaucracy. In November last year, the Tatas, who run Vistara and AirAsia India in joint ventures, had held preliminary discussions to invest in Jet Airways. Tata Group chairman N. Chandrasekaran even took the proposal to the Tata Sons board for approval. However, they withdrew because Jet’s promoter wanted to retain control over the airline which was not acceptable to the Tatas. Now that Mr. Goyal is out of the scene, the Tatas may be interested in making a bid. Earlier, it was estimated that they would invest about $1 billion to acquire a controlling stake in Jet, but now there has been a sharp erosion in value as the airline is on the brink. Analysts estimate Jet’s total liability at more than $2 billion, including bank and aircraft loans of ₹7,500 crore. Little is known about how much debt had been accumulated in last six months. “The last six months has been damaging for Jet Airways. The delay has eaten away the company. Six months back, the valuation could have been better. Now, it is up to the banks on how much haircut they can accept,” said Ansuman Deb, aviation analyst, ICICI Securities. It is understood that Singapore Airlines, which holds 49% stake in Tata SIA Airlines that runs Vistara, is assisting in the bidding process and may pick up a stake. 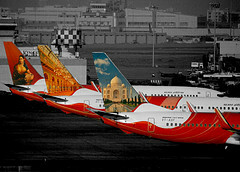 According to analysts, the broader plan of the Tatas is to integrate its existing airlines ventures with Jet Airways. A combination of Jet, Vistara and AirAsia India can pose a tough challenge to IndiGo which is heading towards a near monopoly situation. “The Tatas will be a good option for Jet Airways. They can consolidate and combine the strengths. The Indian aviation sector needs consolidation,” said an analyst asking not to be named. “Air India will survive because it is running with government money, IndiGo will be getting all powerful with $2 billion cash on its books of account. We need one more large airline to match up to IndiGo. Tatas can make it and give a tough competition to IndiGo. Others like SpiceJet and GoAir are too small,” he said. "There is a delay on the B777 payment. But the airline is within the cure period and in touch with the financer to ensure payment", a source in the know told the daily, adding there has been no default notice as yet. However, soon after it missed the due date in end March, Jet Airways reached out to the MNC banks requesting them to condone the payment delay and give the airline some time citing the revival package in the works. Meanwhile, Reuters reported that about six more lessors are expected to apply to the aviation regulator to de-register up to 15 additional grounded planes over the next 10 days, signalling that the planned bailout of the debt-laden carrier is failing to assuage lessor concerns. About 100 of Jet's 119 mainly Boeing planes are leased by companies such as Avolon, GE Capital Aviation Services and AerCap Holdings. Crumbling Jet Airways has massively reduced its operations from its main hub Mumbai to just about 32 flights Tuesday, said an airline source. Amid acute financial crunch, which has also forced it to delay salaries to employees and payments to banks, aircraft lessors and vendors, Jet is struggling to remain afloat. “Jet Tuesday operated only 22 planes, bringing down daily operations to 32 flights from Mumbai, the main hub. This included 16 arrivals and departures each,” the source said, adding the airline didn’t operate the remaining four aircraft. According to him, of the 22 planes it operated, 16 were on the domestic routes and the rest were deployed in the international routes. Jet Airways could not be reached for comment. Civil aviation secretary Pradeep Singh Kharola said had on April 4 said that Jet Airways was flying only 26 aircraft”. May be the final days of Jet.... a Jet aircraft was seized at AMS. Passengers to BOM are stranded. None of the two interested parties are from an airline, could be funds.In the meantime, EY seems to be showing quite some interest. DGCA announced it de-registered seven Boeing 737-800 aircraft of Jet Airways on Wednesday, allowing its lessors to take the planes out of the country so that it can be leased to any other airline. “Jet is operating 14 aircraft today (Thursday),” said a senior DGCA official. These aircraft are: 7 wide body (six B777 and one Airbus A330); 4 Boeing 737 and 3 turboprop ATRs. Government rules stipulate an airline must have at least 20 planes to be eligible to fly abroad. An A330-200, VT-JWQ, has been returned to lessor. Like selling the corpse of a murder victim to its murderer. Into ops suspended for a day. Truly sad to see once the best airline India had to offer to be reduced to this. Hope things turn around for them and they return to their heydays. et Airways cancelled all international flights for Thursday night and Friday morning even as it operated just 14 aircraft during the day — the smallest fleet among scheduled domestic carriers. The aviation ministry had earlier said it would review Jet’s eligibility to fly abroad in case its fleet strength fell below 20 — the minimum number needed to be eligible to fly abroad. The airline had 14 operational aircraft on Thursday — 7 wide body (six Boeing 777 and one Airbus A330) and 7 Boeing 737s and turboprop ATRs. Indian carriers with at least 20 planes in its fleet are allowed to fly abroad. But even before government could review Jet’s eligibility to go abroad, cash crunch will make Jet India’s smallest schedule airline flying only domestic routes till Friday morning. Whether the situation remains like that or changes, will depend on lenders loosening their purse strings as promised. Jet Airways will fly six to seven aircraft on both days this weekend on domestic routes, aviation secretary P S Kharola said on Friday. Looks like 7 EOIs have been received - EY, Goyal, TPG, Indigo Partners, Redcliffe and Think Equity as a consortium, two individuals together and a senior executive vice president (EVP) of Jet with two others. was reading today's news that Jet Airways has a massive pool of debt of around Rs. 8,000 crore. Considering most of the assets are financed, and some are leased, how does an airlines determine the limit of healthy debt. Agreed it has to be more than rest of the industries, but how is it determined? How does an airlines like Indigo diagnose that it is not heading in the same direction. CEO Vinay Dube has been empowered to order a temporary shutdown of the airline which may not be a bad thing. 9W can shut down until they have the investors and finances lined up before resuming ops. 400cr is what 9W is seeking immediately to continue its skeletal ops. I am not sure why the lenders led by SBI have refused to release the 1500cr promised particularly now that they can see that there is interest in buying stake in Jet from external parties. The carrier's active fleet is now down to just five ATR72-500s. Flightradar24 ADS-B data indicates that the only aircraft flying on April 17 are: VT-JCL (msn 791), VT-JCM (msn 793), VT-JCQ (msn 843), VT-JCS (msn 920), and VT-JCV (msn 932). The three former units are owned by Constellation Aircraft Leasing and the latter two by Injet Leasing. A single B737-800 operated by subsidiary JetLite (S2, Delhi Int'l), VT-SJI (msn 34399) also remains active. One of their 77Ws has been impounded in Amsterdam for non-payment of dues. Saw it parked in the KLM maintenance area yesterday. It's all over chaps. RIP Jet Airways. With the Kingfisher nonsense and now the Jet fiasco, the ability of Indian managers to run a full service airline has become the standing joke in the worldwide aviation community.